At least 38 killed and 126 wounded in a series of suicide bombers attack. It has been estimated 300-400kgs of explosives used in this terrifying attack. After a Tukish National Football League Match, very close to the stadium and a police bus a car has been exploded. The sound has been heard even at the Anatolian side of Istanbul. It was a massive explosion and remnants of the bodies were all around. Dozens of police officers were killed by that explosion. Following that attack, police stopped a suspect who was passing at a close road and he trigerred the explosives on himself killing several police officers together with him. 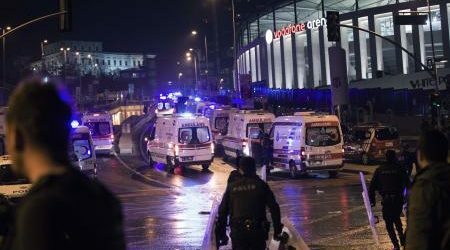 Turkey has been suffering from the suicidal terror attacks especially for the last two years.